A render of an Annihilator Totem. 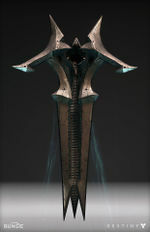 "Ir Anûk pulled a sword star out of the sky. Together the wizards charged it with killing power and made an annihilator totem, which they used to smash the Vex"
Annihilator Totems are Hive constructs found in Crota's netherworld and the Basilica that appear to act as security measures. They were created by the Deathsinger twins Ir Halak and Ir Anûk to battle the Vex when they invaded Oryx's Ascendant Realm, the High War, after Crota accidentally cut a hole through space and time. In Crota's End, four Totems play a part during the Bridge encounter, two on either side of the Bridge. When Guardians attempt to form the Bridge from either side, the two Totems on the same side will begin to charge up, and will eventually release a blast of energy that kills all Guardians. Annihilator Totems can be suppressed by a Guardian standing in close proximity to them, allowing the Bridge to form without Guardians perishing. When three Guardians have successfully crossed, they start forming the Bridge from the other end. In King's Fall, when the Brand of the Weaver/Unraveler is picked up, the nearby Annihilator Totems begin to charge and will cause a wipe if allowed to discharge. Like in Crota's End, Guardians must stand on the Totems in order to suppress them, but Guardians must alternate whom stands on the Totems based on who is holding the brands.